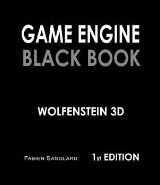 I've been following Fabien's blog for many years, with his excellent videogame source code reviews and in general great articles, so when he announced he was finishing a book about Wolfenstein 3D I got so excited and actually preordered it (on Google Play/Android, read from a 9" tablet). You can actually grasp the contents of the book not only by reading the whole author's blog, but with certain examples, like how the fizzlefade effect was built or how to understand floating point. But to give a general overview, it is a quite specific technical book: You get history about 90s hardware (the 80386, VGA graphic cards, sound systems and the dreaded MS-DOS RAM handling), some background about the team and who did what regarding Wolf3D, but then it is a dive into the source code, analyzing, explaining and commenting the most relevant parts of the game internals, from how the raycaster works to how the sprites were stored, the different subsystems (sound, input, memory, cache, ...). It feels short but is +300 pages long, and also contains appendices and sequels & ports chapters to learn miscellaneous things related with the game. I loved reading it, mostly because Wolf3D was one of the first PC games that actually made me start enjoying my father's 386DX instead of only my beloved AMIGA 500, and while it wouldn't be until 1994 that I started learning to code and grasped VGA graphics programming and assembly, I love the amount of tiny but interesting details that I've learned, from how a digital joystick worked and would be read its inputs, to why there were different sound formats or how clever were the guys at id storing the sprites to speed up even their reading and writing with VGA planar modes. As I was reading a book about generating computer mazes I read the book announcement and couldn't resist to try to adapt the maze generators to export Wolfenstein 3D maps. The result can be seen here, as Wolf3D doesn't supports mods or external maps easily, I decided to reverse-engineer NMap's (an unnofficial mapping tool) .LEV file format and generate those files with simple data.